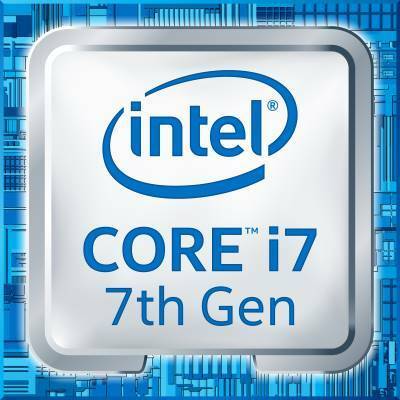 The Intel Core i7-7500U is the fastest dual-core processor in the 7th Generation Intel Core series. You can find it in mid-range and higher-end mainstream laptop PCs. As the main advantage over the very similar 6th Gen i7-6500U, the i7-7500U has higher clock speeds of 2.7 GHz and 3.5 GHz in normal and TurboBoost modes, respectively, up from 2.5 and 3.1 GHz. Also, Intel highlights further improvements of ultra high-definition 4K video playback of the 7th Gen chips. As you can see in the chart above, only the quad-core Intel Core processors are faster than the dual-core i7-7500U. Still, the i7-7500U offers a great performance-per-Watt ratio. It consumes 15 Watts of power, whereas the slightly faster i5-5300HQ quad-core consumes 35W. Therefore, the i7-7500U is an ideal choice for advanced users who need extra computing power without sacrificing battery life. On the other hand, most of the home and office laptop users will find the cheper 7th Gen Intel Core i3-7100U and i5-7200U (review) completely sufficient for web surf, MS Office, media playback and other common tasks. For these day-to-day duties, the i7 chip doesn’t bring any significant improvement, while in more heavy scenarios like video transcoding, it can speed up operations. The Intel Core i7-7500U features the Intel HD 620 integrated graphics. It’s suitable only for non-demanding games, but nevertheless it can play many of the popular game titles, as described in this review of the HD 620.
installation fails and message comes that my processor type is not supported. i want help from you. is it suitable for video editing ? P.S. If you plan to run games on Intel HD integrated graphics anyway, it would be much better to have 2 RAM modules in your laptop instead of 1. Like 2x4GB vs 1x8GB. I am planning to upgrade the RAM of Intel Core i7-7500U 7th Gen Laptop from 4GB to 8GB. Hi, upgrading to 8GB makes sense if your RAM usage exceeds 4GB. For instance, if you run many web browser tabs at the same time, plus other programs like media players, MS Office, etc. If you never exceed 4GB, then you won’t see any noticable benefits of having 8GB RAM. Do you plan to replace your 4GB RAM module with an 8GB module or adding another 4GB stick besides the existing one? If the latter is the case, then you’ll have benefit of dual-channel memory, which can improve gaming performance of the processor’s integrated graphics. Yes, the processor can play fluidly videos recorded with smartphones, including high-resolution videos like Full HD or Ultra HD. The only problem I experienced when playing very high resolution videos (UHD) on this type of processor was software related stuttering. In particular, with VLC media player program. Also missing video codecs software on your system can cause problems. But, the i7-7500U itself is more than capable of playing videos. I bought and tested with my options and processors running over the net was great!!! !